The Dodge Dart uses technology from Fiat. AUSTIN, Texas -- The 2013 Dodge Dart is the first car built by U.S. carmaker Chrysler Group using a platform and technology from Chrysler's Italian owner, Fiat. The car uses the company's CUSW (Compact US Wide) architecture and is based on the Alfa Romeo Giulietta. A reworked China-built version of the Dart, the Viaggio, will be launched in China in September. The Fiat technology gives the Dart European driving dynamics, an optional turbocharged engine and a high-mileage version that will deliver an estimated 41 mpg on the highway. The Dart, set to begin production and arrive in showrooms this quarter, replaces the Dodge Caliber as Chrysler's entry in the compact segment, which Chrysler says accounts for 15 percent of the North American market. 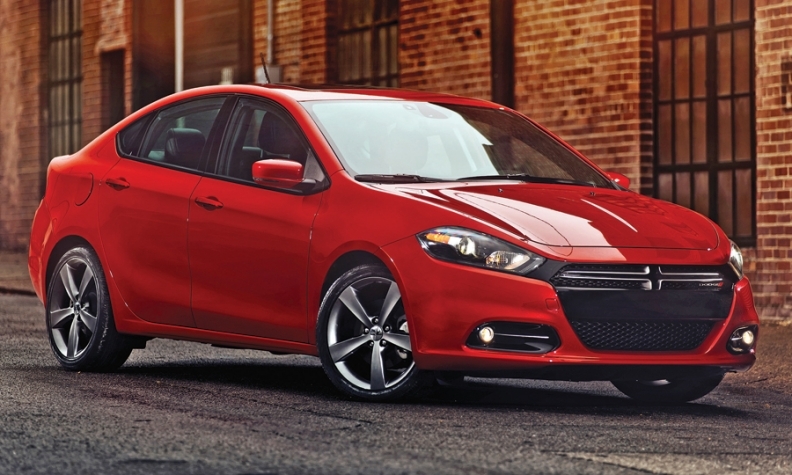 The Dart is Chrysler's first compact sedan since it stopped making the Neon in 2005. The basics: The Dart will debut with two engines and two transmissions available, with other options coming later in the year. Standard is a re-engineered Chrysler 2.0-liter inline-four that delivers 160 hp and 148 pounds-feet of torque combined with a Fiat-sourced six-speed manual. Optional is a 1.4-liter turbocharged four-cylinder engine and a six-speed automatic transmission from Hyundai. A 2.4-liter inline-four with Fiat's MultiAir variable valve timing and a six-speed dual dry clutch automatic transmission are due later, as is a promised nine-speed automatic and an Aero high-mileage version that will boost the Dart's highway fuel economy rating to at least 41 mpg. In the cabin, the Dart borrows styling cues from the larger Dodge Charger sedan, including an optional 8.4-inch center console information screen and soft-touch materials on the instrument panel and doors. The seats are wide and heavily bolstered. Notable features: The 97.2 cubic-foot cabin feels ample for a compact sedan. The Dart's configurable 7-inch instrument panel display is a first in the segment. The Dart's glove box is large and deep enough to hold a full-sized laptop. Heated steering wheel, backup camera, cross-path detection, park assist and blind-spot monitoring also are available. On the exterior, designers adopted an LED rear-light design that resembles a racetrack, though it's available only on higher-trim models. Engineers included a number of features to improve airflow, including active grille shutters and underbody cladding. What Dodge says: "We want consumers to be able to personalize their vehicles -- to say, 'This is mine.' -- like they do with their cell phones," says Richard Cox, director of the Dodge brand. The Dart will have five trim levels, with 12 exterior and 14 interior colors available at no added cost. Consumers may order many features separately, or within option packages. Shortcomings and compromises: On preproduction vehicles at a media event this month, some trim pieces on the base SE model still had a few hard plastics, and the naturally aspirated 2.0-liter with manual struggled up some of the Texas hill country, unlike the 1.4-liter turbo. Chrysler spokespeople could not say if those issues were limited to the individual car tested or would remain once production started. The market: The Dart squares off against tough competition from the Chevrolet Cruze, Ford Focus, Honda Civic, Hyundai Elantra, and Toyota Corolla in a segment that Chrysler says represents about 2 million vehicles annually. Chrysler hasn't released a sales projection for the Dart but is confident it can easily outpace the 35,049 Calibers sold in the United States during 2011. The skinny: The Dart is far better equipped than the Caliber. And the Dart compares favorably with segment competitors on price, performance, handling, build quality and equipment. The 2013 Dodge Dart will enter a crowded compact sedan market. The base version is heavier than the 2012 Chevrolet Cruze but has more horsepower and torque. Wheelbase 106.4 in. 105.7 in. Length 183.9 in. 181 in. Width 72 in. 70.7 in. Height 57.7 in. 58.1 in. Curb weight 3,186 lbs. 3,093 lbs. EPA mpg 27 city/39 hwy. 25 city/36 hwy.